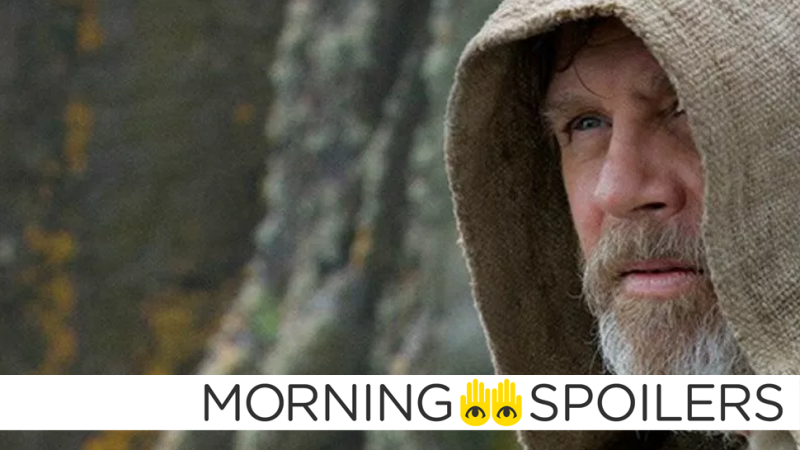 Mark Hamill clarified his recent statements about “fundamentally disagreeing” with director Rian Johnson’s choices for Luke Skywalker. Not gonna lie—I’m still kind of worried about this. It’s good that Hamill came around to Johnson’s way of thinking, but if his gut reaction was to tell the director “I think all of this is wrong for Luke” then... well, that just seem like a potential cause for concern. According to Mark Hughes from Forbes, the recent reshoots on Justice League have mostly been of all-new scenes. In related news, the film’s erstwhile composer, Junkie XL released a statement on Twitter about getting swapped out for Danny Elfman. During an interview for Cars 3, Kerry Washington told Screen Rant her production company, Simpson Street, is adapting an undisclosed comic book about a “teenage girl” into a movie. Oh, man. I would definitely be open to doing another superhero movie. My company is actually working right now on a comic book movie that’s not a superhero movie, but it is a comic book movie. Um, its about a teenage girl. Um, but I… you know, I’m really open. I’m really open. I feel like the landscape is so open in terms of, you know, casting against type when it comes to you know to even gender, race, so, um, I’d love to do it. I’d love to be apart of another franchise like that. I’d love to kind of break new ground and tell a new story that hasn’t been told, so I’d love to do it. I feel like the thing about comics and animated films is because somehow we are suspending our disbelief because to enter into an alternate universe, we’re able to get to the core of our humanity. While we don’t usually report on what people express interest in making, this one’s worth mentioning: frequent DC/CW and Doctor Who episode director Rachel Talalay just told Vice she wants to make the She-Hulk movie. I have such a strong vision of what She-Hulk should be. The difference between She-Hulk and Hulk is that she loved being She-Hulk. She was the Tank Girl of earlier days in terms of being able to say what she wanted, and when she became She-Hulk, it was like an opening of the door to freedom, to be the person that you wish you could be. That you’re stopped from being as a woman. And that’s the version of She-Hulk that I would love to embrace. Hot on the heals of Pixar’s Coco, Reel FX Animation Studios and director Jorge R. Gutierrez have announced a sequel is in development to the underrated Book of Life. The sequel grew from...people asking what was gonna happen with the characters, what’s gonna happen to the gods? The sequel embraces all these things and, in a weird way, is a continuation of the story with everybody you love from the first movie. I am a big fan of romantic movies. I always want to find out what happens afterwards. That’s one question we will ask during the sequel. The Book of Life 2 will be the continuation of an extraordinary story that technically and creatively captures the vision Jorge had of this fabulous world. The original film broke ground in so many ways and we hope that the sequel will have the same impact for the fanbase. Entertainment Weekly reports both Pixar are Disney animators are working on an animated musical sequence set inside a Royal Doulton bowl. The scene will feature the penguins of the original film. Benedict Cumberbatch’s “movement coach” has revealed the actor is now filming his scenes as Doctor Strange. Empire has a new image of Ryan Gosling and Harrison Ford as they’re about to throw down in a funky neon dayglo nightclub. Sure, it’s not scifi in the way a novel by Charles Stross might be, but if you don’t want to see these characters posters from Edgar Wight’s latest, Eiza Gonzalez here has some terse words for you. More at the link. The sixth Transformers film said to be set on Cybertron is hitting theaters June 28th, 2019, but according to Hasbro’s Brian Goldner, no director is attached yet. Mark Wahlberg rumbles with Cogman in a clip from The Tonight Show. Here’s a corny TV spot featuring Hound practicing his lines. Michael Bay has also released several new production pics on his website — you’ll have to head there over to see them. Lastly, Transformers News reports the official running time is a staggering 2 hours, 28 minutes and 53 seconds long. Producer Salim Akil has confirmed to the IBTimes that Tobias Whale, a character DC has previously had rights issues over, will be the overarching villain of season one. It’s a character driven show. I don’t know if there’s going to be a fight every week. There’s certainly not going to be a villain of the week. I don’t want to do that. We really want to explore the characters, even the villains. I think one of the most interesting characters right now from a storytelling standpoint is Tobias. Because we’re not having him sort of twist his mustache. His hatred for himself and for others comes from a real place, so we want to know why he’s like that. Akil also stated that, while there are currently no plans, he’d love to bring Static into the fold. I love the idea of Static Shock, and in success, hopefully, we’ll be able to pull other characters in in that way. So I’m holding out hope because I love that character. Producer Shawn Levy warned THR that fans may be “disappointed” by some decisions made in season two. Most of them Barb-related. We are going to do things that fans will be disappointed in but I think they will be more satisfied by… I’ll give one example that I’ve been asked about a hundred times which is people still think Barb’s alive. Because you think you want that but you wouldn’t really want that. In a separate interview, David Harbour discussed Hopper’s character development—possibly expounding on these controversial decisions Levy is referring to. He’s a different man than he was in season one and he gets to go on a different arc. The first season he really sort of discovered why he was dead inside and like how he was finding his way out and he kind of came to life. And so in the second season, his arc is very different. We start with a man who has sort of become heroic in a certain way, right? I mean he still has some of his stuff but he has gone on this heroic journey and now sort of the beginning of the [first] episode, we start examining the perils of what it is to be a hero or perhaps the fantasies that you have about yourself and the dangers of that. And that subtle arc takes him in a different direction which, I think, is equally satisfying but very, very different. Henry Ian Cusick revealed some details about his mysterious character, Dr. Declan, to Cinema Blend. I play a geneticist and his name is Dr. Evan Declan and he’s human. I think that says quite a lot already, if you know the comics, you know where the Inhumans are coming from, so that’s pretty much my character. Kevin Feige has once again confirmed there are currently “no plans” to cross over Marvel’s film and television properties. Maybe someday. No plans right now. Maybe someday, but we have a lot of characters in the MCU, and one of the things that is so special about those characters on the Netflix shows is their dynamic together. They are all combining to become The Defenders later this year and are doing their own thing. Good news! Netflix has renewed Bill Nye for a second season. Finally, join Jesse, Tulip and Cassidy as they discus the ethics of neonatal circumcision in their search for God.